Monogramed wall art is a popular trend for adding the personal touch to your home decor. We have used the First Edition Kaleidoscope papers for our DIY tutorial to create a striking and colourful feature. 1. 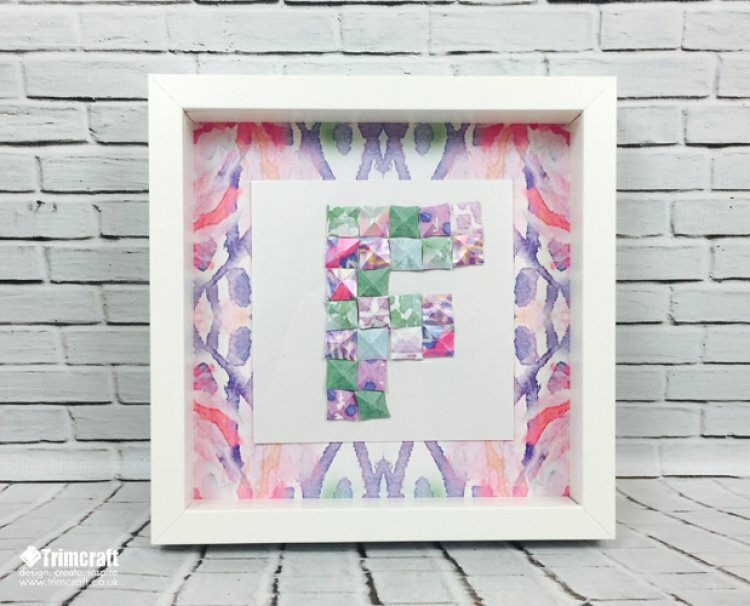 To create your monogram, cut several 1.7cm squares out of different First Edition Kaleidoscope papers and score the back of the paper from each corner. Fold along the score line to shape each one. Continue to do this to until you have enough squares for your monogram. 2. Cut the card blank in half across the fold and stick your squares onto the centre of the card with foam pads. 3. To fit our frame, we have cut a piece of patterned First Edition Kaleidoscope 12” x 12” papers into a 23cm square and fixed the pearlescent card onto the centre using double sided tape. To finish, insert your paper wall art into the photo frame. As an alternative, you can use your paper squares to make interesting shapes like diamonds and hearts. Made anything for the home recently? We would love to see what you have made; simply upload your crafty makes onto the project gallery.